Glam Morena: Laura Geller Baked Vanilla Nudes. Laura Geller Baked Vanilla Nudes. I wanted to share a purchase from HauteLook that I ordered from the Laura Geller sale they had a few weeks ago. I purchased the Laura Geller Baked Vanilla Nudes Collection. If you aren't already be sure to click here to sign up to HauteLook for their future sales. I first spotted this kit on the QVC website last year and I've wanted it ever since then. It normally retails for $58.00, but I was able to get it for $34.50 from HauteLook. 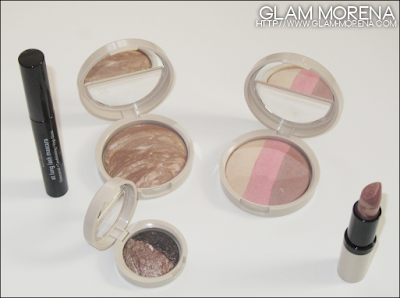 Be sure to check out the video for some Laura Geller swatches! Do you own this kit? Do you own any Laura Geller products? Thoughts? These look so soft and yummy! Especially the trio. Looks like Neapolitan, Im hungry much??? :) I can't wait to see how you pair these.